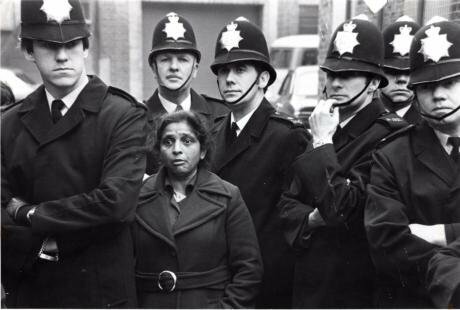 Forty years ago in 1976 a group of workers, predominantly South Asian women, led some of the biggest mobilisations the labour movement has ever seen in Britain. 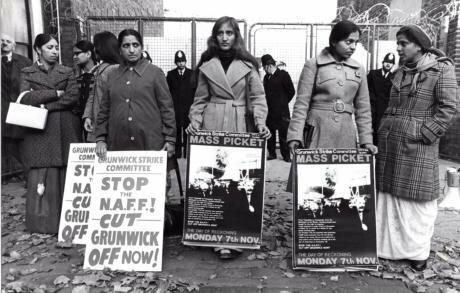 A small factory, the Grunwick photo processing plant situated in a residential backstreet in Willesden, north west-London, became the focus for trade union activity which put South Asian women centre-stage for the first time. Although rather patronisingly dubbed “Strikers in Saris” by the press who liked to emphasise the exotic novelty of Asian women on picket lines, the images of the strike remain undeniably powerful and have served as an inspiration to generations of Asian women who came after them. Jayaben Desai. Photo: Phil McCowan. Pushed to breaking point by compulsory overtime and a host of other petty humiliations, Jayaben and five others walked out demanding the right to join a trade union and were subsequently sacked. They kickstarted a two-year dispute that challenged not just the stereotypes of Asian women within wider British society but also within an overwhelmingly white, male trade union movement. The Grunwick management were keenly aware of how to exploit this situation. Owner George Ward, an Anglo-Indian himself, said (falsely) about one striker “She’s only gone on strike because her boyfriend’s on the picket line”, knowing full well that spreading a rumour about her having a boyfriend could lead to community disgrace. But of course, this wasn’t the first time that South Asian women had been part of the struggle against workplace exploitation – they had been at the forefront of earlier industrial disputes of Asian workers, most of which were at best largely ignored and at worst actively obstructed by trade unions. Most notably at Imperial Typewriters in Leicester in 1974, just two years before Grunwick, when Asians went on strike at being paid lower wages than white workers. Their trade union didn’t just fail to back the strikers but actively opposed them so becoming complicit in maintaining a racist wage differential. The ideas of the National Front, who had been organising within workplaces and agitating on the issue of immigrants and wages, ran deep. Perhaps it was because the dispute at Grunwick was primarily about trade union recognition, rather than one that was explicitly raising concerns of racism or sexism, that the Grunwick strikers were able to bring the ranks of the British trade union movement to Willesden. A series of mass pickets intended as a show of strength and with the aim of stopping strike-breakers from entering the factory attracted 20,000 from across the country, steel-workers and miners among them. Local postal workers, key to Grunwick’s operation as a mail-order business, refused to handle Grunwick’s post. Even dockers who just a few years earlier had marched in support of Enoch Powell were now giving support to a group of Asian women. Grunwick was the first time foreign-born workers were, however fleetingly, seen as part of the British working-class. The strike still failed. The postal workers’ union (the UPW) capitulated at the threat of a legal challenge to the postal boycott, effectively halting any form of secondary action and the strikers union (Apex), disconcerted at the militancy of the pickets and keen not to embarrass the Labour government, also eventually withdrew support. And so, at the hands of the trade union leaderships, one the biggest mobilisations of the labour movement which built feminist and anti-racist solidarity became one of the biggest betrayals in working class history. Since Grunwick Asian women have continued to sustain and lead workplace disputes. A year later in 1979 workers won their battle for union recognition at the Chix bubblegum factory in Slough. Other disputes – at Burnsall’s metal finishing factory in 1992, Hillingdon Hospital in 1995 and Gate Gourmet in 2005 – were less successful and, like Grunwick, all ended with strikers feeling betrayed and let down by their respective unions. It has been these migrant communities, whom Satnam Virdee has termed “racialized outsiders”, who have been central in key challenges to workplace exploitation in Britain – a fact which continues to be sidelined by the mainstream trade union movement. Now the story of Grunwick and the lessons we can draw from it are examined in a new exhibition on display at the Brent Museum. Using exclusive archive material originally collated by Brent Trades Council, photographs, and news reports “We are the lions” celebrates the inspirational women of Grunwick while also tracing the threads which connect it, and some of its preceding struggles, to those happening in today’s workplaces. Now non-unionised casual labour and zero-hours contracts are seen as normal. Low-paid jobs, such as those at Grunwick are off-shored to India or the Philippines, while those that cannot be off-shored – cleaning, care work and catering – are where women and migrants are concentrated. Parallel to this the emergent ‘gig economy’ driven by new technologies represents an even more disposable workforce where not only can you order a taxi, food delivery or a cleaner via an app, you can also be effectively hired and fired via it too. What gives us hope for the future are the vocal campaigns being run by those at the sharp end of this exploitation. The cleaners at SOAS and LSE and the teaching assistants at Durham are leading some of the most inspirational campaigns in Britain today – against outsourcing, low pay and for dignity at work. Some, as migrants, have had experiences of organising for their rights in their countries of origin and, although much has changed in the forty years since Grunwick, as they challenge exploitative employment practices here in the UK, it is clear that issues of race and gender are still at the forefront. “From Grunwick to Deliveroo: getting organised, getting unionised”, a one-day conference on migrant workers, trade unions and the new economy takes place on Saturday 26 November at Willesden Library (free but registration advised). “We are the lions” the exhibition commemorating the Grunwick strike is open until Sunday 26 March 2017 at Brent Museum & Archives, The Library at Willesden Green, 95 High Road, London NW10 2SF.